Solder your LEDs in a parallel line on a strip of double wire about a foot long, spaced an inch apart (see image below). Leave a little room at the end for the switch and battery. 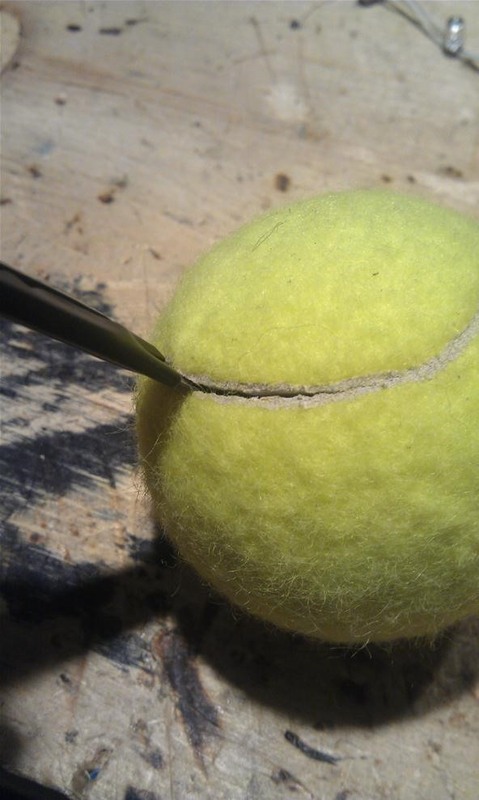 Now, take your tennis ball and cut a square hole for your switch. 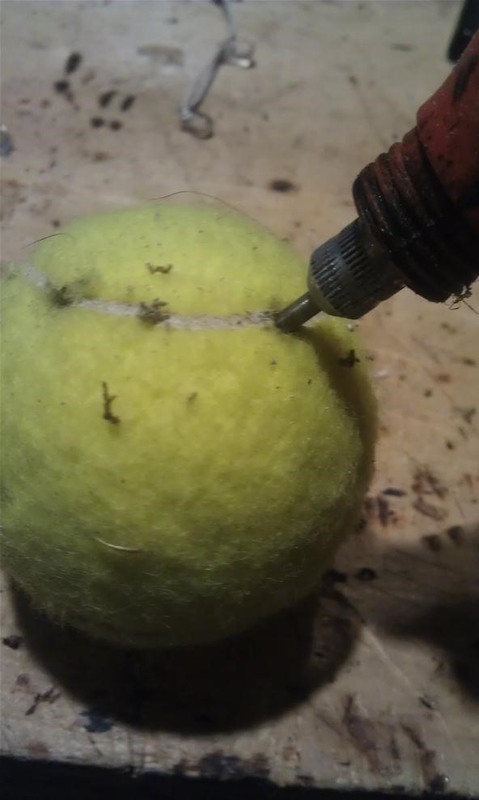 Then, drill holes (with a drill bit about the size of the LEDs you chose) one inch apart, all along the "white line" that wraps around the tennis ball. This smells awful, looks awful, and creates smoke, so do it in a well ventilated area. 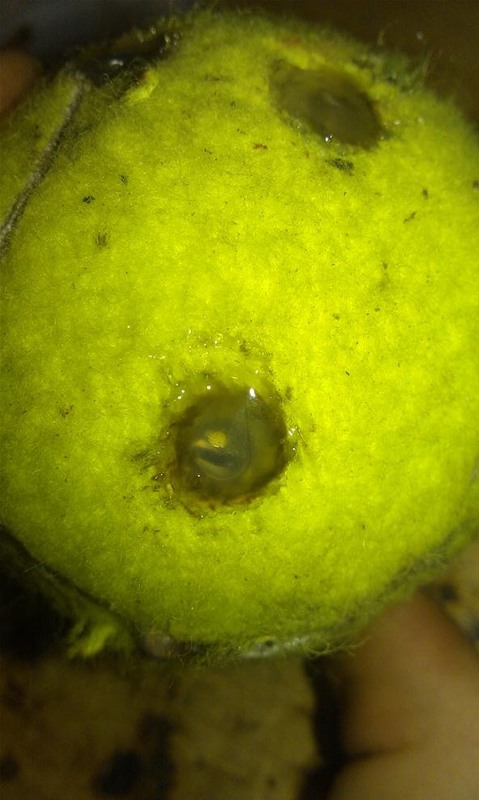 Squeeze all the LEDs into the holes you drilled in the tennis ball, and test it out. If nothing lights up, check your connections. Now carefully insert the switch and battery so that it fits snugly, without shorting any connections. 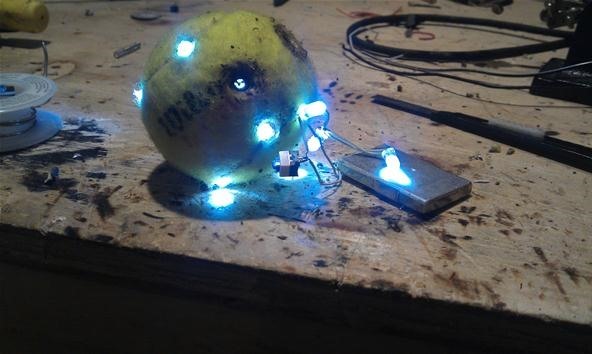 I had a few extra LEDs, so I added them into extra holes in the ball. Feel free to do so yourself, however it gets more difficult with more LEDs. Glue the hole you cut closed with rubber cement, and hot glue if you see fit. Then hot glue around the LEDs, so that the glue fills in the holes around them. Test it again, and your done! The cell phone battery should last for a very, very long time, mine's been going for intermediate use for the last six months. 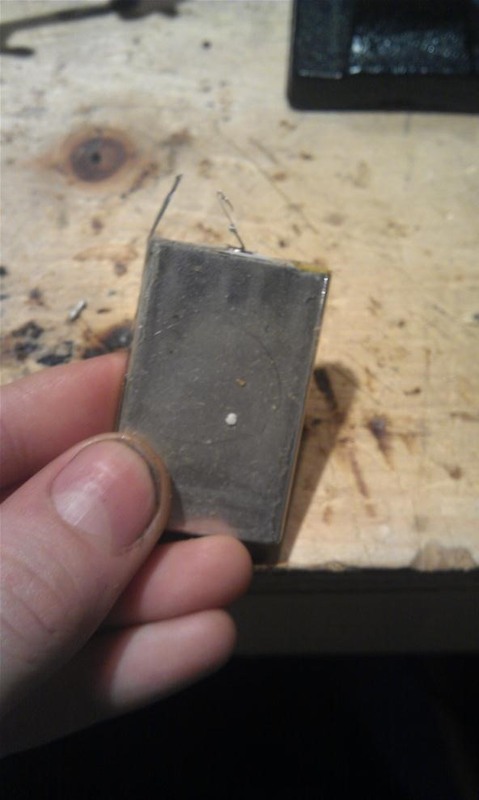 Shave off any "Guck" left over from drilling with an exacto knife. It looks better. Cut off any excess glue—again, it makes it look better. 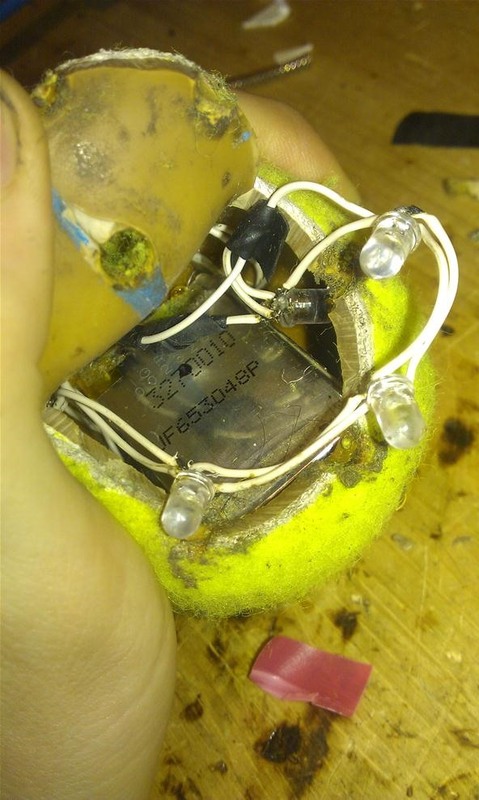 Don't over-exert the wires when inserting LEDs; it's damaging, and you will end up resoldering connections. Don't drop excessively or smash, the electronics are relatively fragile. Soldering irons are hot! Be careful. Same goes for the glue gun. Don't short the cell phone battery, its damaging and can be dangerous. Again, don't abuse your glowing orb, they are fragile. Protect the soul within. Don't throw at people!! This is not Skyrim. 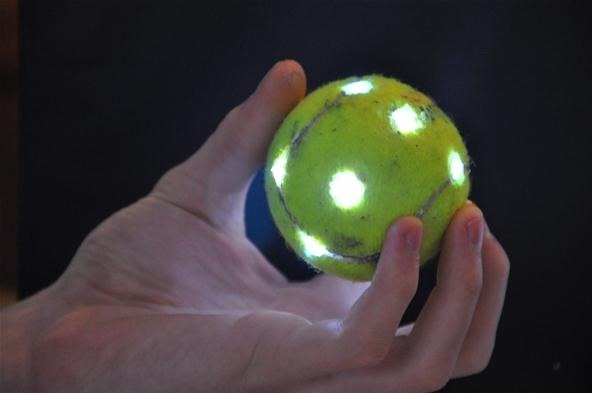 If this bounces, it's great for playing with a dog in the dark. very cool. It doesn't bounce very well, unless you fill it with silicone :) For those who want a bouncy orb, just buy some standard silicone and squirt some into the ball before you glue the hole shut. Allow to dry for about two days, then seal up the opening. Very cool. 6 months out of one charge is amazing. i know! those lithi-ion cell phone batteries have quite the capacity. of course, that was six months of intermittent use, not constant. I'm curious to how my kitty will react to it xD. I love LED lights. They cost a lot initially for your house, and theyre a little dim, but my blackouts are always drawn anyways because I use a projector instead of a TV. But they're so worth it. Lights barely contributes to my electric bill now because of how little electricity they use :D.
Neat idea. Have you tried using the multi-color LED lights? The ones from Radio Shack will cycle through seven different colors with no special circuit needed. 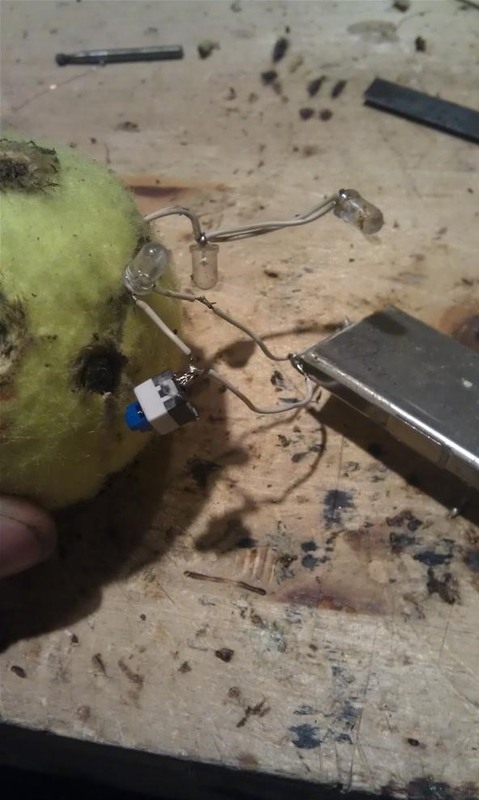 It's built in to the LED. How about a light chaser circuit for your LEDs?